A series of bad dates, a middle school science fair and an encounter with a fortune teller machine are just a few of the topics that will be explored in a series of one-act plays produced by Estacada High School students this week. The student-directed one-acts are scheduled from 7-9 p.m. Thursday, Feb. 15, through Saturday, Feb. 17, at the Estacada Auditorium, 500 N.E. Main St. Admission is $5 per person. During the event Kourtney Sandidge will direct "Zeus, What Did You DO? !," Megan Flohr will direct "The Twilight Zone: In the Nick of Time," Megan Tuthill will direct "Regina Flector Wins the Science Fair," Brenna Pierce will direct "!Artistic Inspiration" and Kamie Tenbush will direct "Check, Please, Take Two." 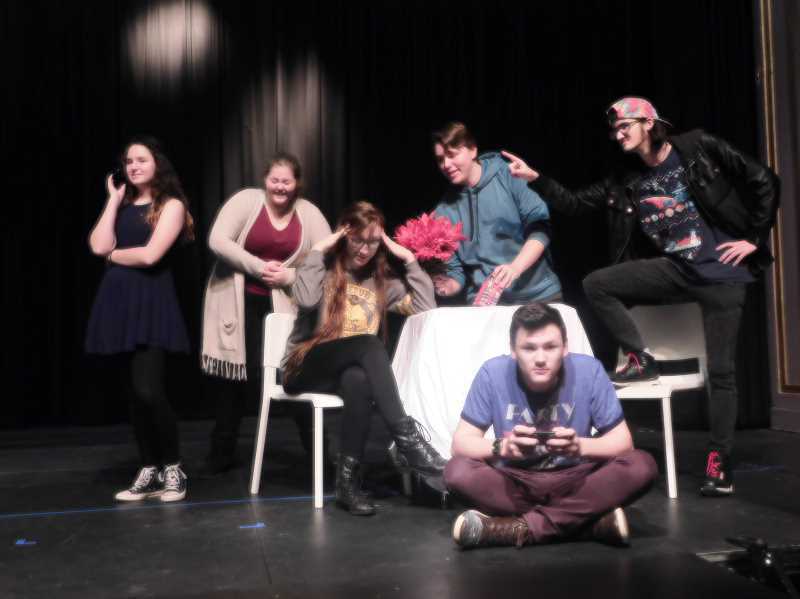 In addition to the one-act plays, drama students who attended the Oregon Thespians Regional Acting Competition will showcase the monologues and other pieces they performed. Cast members appreciate the different stories that are told during the one-act event. "There's a lot of diversity," said Eric Sohnrey. "There's comedy, romance and drama." "There's a lot of laughing, and crying while laughing," Michael Swenson added. Cast members also appreciate that the one-act plays delve into a single topic. "Big plays focus on a variety of different places, and with these you can really focus on one thing," said Alissa Piers. "They're not big spectrum stories. It's cool having them right after one another. It's a good contrast." Kamie Tenbush, one of the student directors, has enjoyed working with "Check, Please, Take Two." She directed "Take One," the show's previous installment, last year. "I like being able to form my friends into other characters they'd be good as." "I read the script and thought it was hilarious, and something we'd never done before," she said. The story follows a series of couples who are on bad dates. "It's pushing people outside of their comfort zones," Tenbush said. "The characters are all horrible people. They're whacky." She described the series of one-acts as "a wild ride." "It's totally worth it," Tenbush said. "All of the one-acts are super different. It's a mess of emotions, and it will be so much fun." Cast member Emma Jillette also said the event will be memorable. "It's not like every other high school play," she said. "These are going to be different."